Clinique's US eCommerce website was undergoing a redesign and a platform migration. Their new site would embrace responsive design, and be built upon a more modular architecture than the previous version. The brand already had Bazaarvoice's Ratings & Reviews solutions on the majority of its worldwide sites. The new design for the US site would eventually be rolled out to other countries and languages, so the new reviews layout needed to be flexible to accommodate multiple languages. When redesign projects come through the Bazaarvoice design team, designers like myself would usually just apply updated CSS and images to the basic reviews layout and reviews submission form to match the client's updated site design. 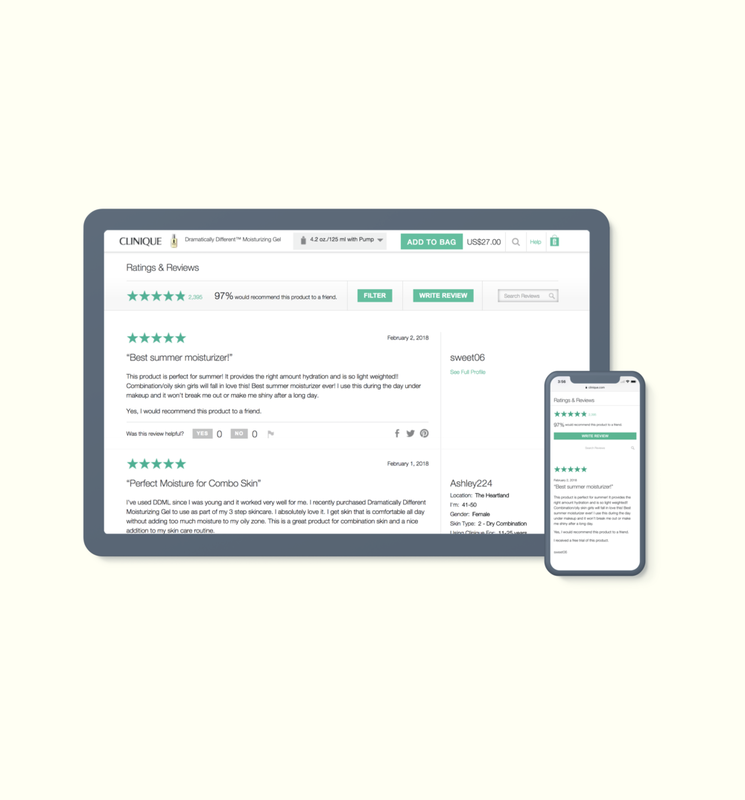 In the case of Clinique, their design team had created preliminary high-fidelity mockups of the updated reviews layout design and review submission form. Based off of the groundwork that they did, I guided the design for the features that were not included within their initial mockups. Several innovative features, like the "Featured Reviews" block and expanding filtering box, were created especially for this layout by myself and an engineer on my project team. Clinique's Ratings & Reviews solution from Bazaarvoice is used every day by hundreds of thousands of shoppers on mobile, tablet and desktop. This design continues to be rolled out to new countries and in new languages as more of the brand's websites undergo redesigns.